Illustration from "Detective Stories Gone Wrong: The Adventures of Sherlaw Kombs." Used by permission, L. Tom Perry Special Collections, Harold B. Lee Library, Brigham Young University. Introductory Note: “Detective Stories Gone Wrong: The Adventures of Sherlaw Kombs” is a parody of the Sherlock Holmes stories by Sir Arthur Conan Doyle. Doyle had already published two Sherlock Holmes novels and several short stories by the time this story was printed in The Idler. It contains many exaggerated tropes from detective fiction, such as the eccentric detective, a narrator who is the detective’s friend, and deducing things about a person from his or her appearance. I DROPPED in on my friend, Sherlaw Kombs, to hear what he had to say about the Pegram mystery, as it had come to be called in the newspapers. I found him playing the violin with a look of sweet peace and serenity on his face, which I never noticed on the countenances of those within hearing distance. I knew this expression of seraphic calm indicated that Kombs had been deeply annoyed about something. Such, indeed, proved to be the case, for one of the morning papers had contained an article eulogising the alertness and general competence of Scotland Yard. So great was Sherlaw Kombs’s contempt for Scotland yard that he would never visit Scotland during his vacations, nor would he ever admit that a Scotchman was fit for anything but export. He generously put away his violin, for he had a sincere liking for me, and greeted me with his usual kindness. “I haven’t heard of it,” he said quietly, just as if all London were not talking of that very thing. Kombs was curiously ignorant on some subjects, and abnormally learned on others. I found, for instance, that political discussion with him was impossible, because he did not know who Salisbury and Gladstone were.1The Marquess of Salisbury and William Gladstone were leaders of the Conservative and Liberal parties, respectively. This made his friendship a great boon. This was one of the things I always liked about Kombs. There was no professional jealousy in him, such as characterises so many other men. He filled his pipe, threw himself into his deep-seated arm-chair, placed his feet on the mantel, and clasped his hands behind his head. “Tell me about it,” he said simply. “COME IN!” shouted Kombs, without changing his position, but with a suddenness that startled me. I had heard no knock. “Ah, you have an appointment. In that case I will not intrude,” I said, rising. I gazed at him in amazement. Accustomed as I was to his extraordinary talents, the man was a perpetual surprise to me. He continued to smoke quietly, but evidently enjoyed my consternation. There was a rap at the door this time. A stranger entered. Sherlaw Kombs did not change his lounging attitude. “I wish to see Mr. Sherlaw Kombs, the detective,” said the stranger, coming within the range of the smoker’s vision. “This is Mr. Kombs,” I remarked at last, as my friend smoked quietly, and seemed half-asleep. “Allow me to introduce myself,” continued the stranger, fumbling for a card. “There is no need. You are a journalist,” said Kombs. “The devil!” cried the journalist, sinking into a chair and mopping his brow, while his face became livid. A frown marred the brow of my friend as he placed his pipe on the sideboard and drew his self-cocking six-shooter. “Then heaven help you,” cried Kombs, slowly raising his right arm. “How do you know my name?” he gasped. Kombs waved his hand impatiently. I then noticed for the first time that the name was plainly to be seen inside the top-hat Scribbings held upside down in his hands. Mr. Sherlaw Kombs pondered for a few moments, smoking his pipe silently. Mr. Scribbings was too much astonished to return the greeting. He left in a speechless condition, and I saw him go up the street with his hat still in his hand. Sherlaw Kombs relapsed into his old lounging attitude, with his hands clasped behind his head. The smoke came from his lips in quick puffs at first, then at longer intervals. I saw he was coming to a conclusion, so I said nothing. I was only too happy to have the privilege of going with him. It was most interesting to watch the workings of so inscrutable a mind. As we drove under the lofty iron roof of the terminus I noticed a look of annoyance pass over his face. The great Scotch Express stood ready for its long journey. The detective tapped one of the guards on the shoulder. “I’ll see to that, sir,” answered the guard, locking the door. When the official moved away, I asked my friend what he expected to find in the carriage that would cast any light on the case. “Nothing,” was his brief reply. “But the door on this side is locked,” I objected, trying it. I admitted such was the case. Mr. Sherlaw Kombs drew down the window on the right hand side, and examined the top of the casing minutely with a magnifying glass. Presently he heaved a sigh of relief, and drew up the sash. At this moment the whistle sounded shrilly, and we felt the grind of the air-brakes. As the train stopped, we got out on the right-hand side of the line. The engine stood panting impatiently under the red light, which changed to green as I looked at it. As the train moved on with increasing speed, the detective counted the carriages, and noted down the number. It was now dark, with the thin crescent of the moon hanging in the western sky throwing a weird half-light on the shining metals. The rear lamps of the train disappeared around a curve, and the signal stood at baleful red again. The black magic of the lonesome night in that strange place impressed me, but the detective was a most practical man. He placed his back against the signal-post, and paced up the line with even strides, counting his steps. I walked along the permanent way beside him silently. At last he stopped, and took a tape-line from his pocket. He ran it out until ten feet six inches were unrolled, scanning the figures in the wan light of the new moon. Giving me the end, he placed his knuckles on the metals, motioning me to proceed down the embankment. I stretched out the line, and then sank my hand in the damp grass to mark the spot. “It is the pistol,” said Kombs quietly. Journalistic London will not soon forget the sensation that was caused by the record of the investigations of Sherlaw Kombs, as printed at length in the next day’s Evening Blade. Would that my story ended here. Alas! 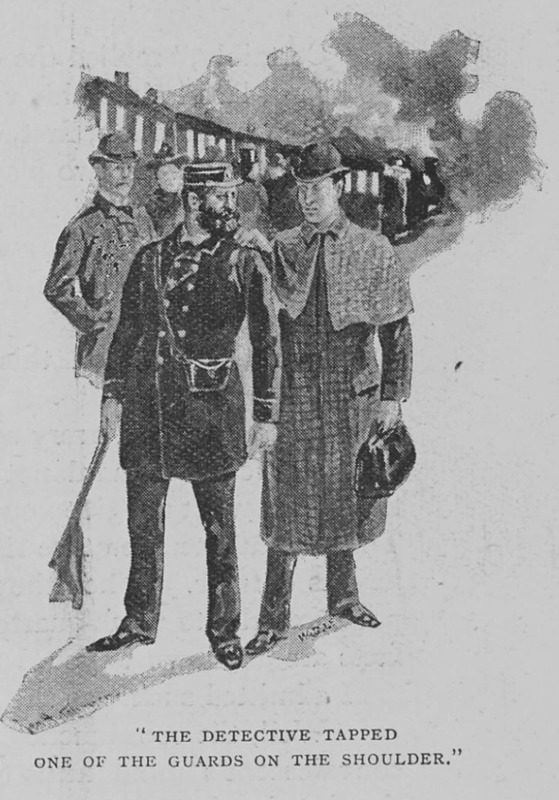 Kombs contemptuously turned over the pistol to Scotland Yard. The meddlesome officials, actuated, as I always hold, by jealousy, found the name of the seller upon it. They investigated. The seller testified that it had never been in the possession of Mr. Kipson, as far as he knew. It was sold to a man whose description tallied with that of a criminal long watched by the police. He was arrested, and turned Queen’s evidence in the hope of hanging his pal.2Queen’s evidence is testimony a suspect gives against other suspects in order to reduce his or her own sentence. It seemed that Mr. Kipson, who was a gloomy, taciturn man, and usually came home in a compartment by himself, thus escaping observation had been murdered in the lane leading to his house. After robbing him, the miscreants turned their thoughts towards the disposal of the body—a subject that always occupies a first-class criminal mind before the deed is done. They agreed to place it on the line, and have it mangled by the Scotch Express, then nearly due. Before they got the body half-way up the embankment the express came along and stopped. The guard got out and walked along the other side to speak with the engineer. The thought of putting the body into an empty first-class carriage instantly occurred to the murderers. They opened the door with the deceased’s key. It is supposed that the pistol dropped when they were hoisting the body in the carriage. The Queen’s evidence dodge didn’t work, and Scotland Yard ignobly insulted my friend Sherlaw Kombs by sending him a pass to see the villains hanged. Barr, Robert. "Detective Stories Gone Wrong: The Adventures of Sherlaw Kombs." The Idler, vol. 1, no. 5, 1892, pp. 413-24. Edited by Taylor Topham. Victorian Short Fiction Project, 25 April 2019, http://vsfp.byu.edu/index.php/title/detective-stories-gone-wrong-the-adventures-of-sherlaw-kombs/. 1. ↑ The Marquess of Salisbury and William Gladstone were leaders of the Conservative and Liberal parties, respectively. 2. ↑ Queen’s evidence is testimony a suspect gives against other suspects in order to reduce his or her own sentence.